India has a population of over a billion and our ideas about the country are often informed by that statistic. Yet there are places on the sub-continent which are still almost inaccessible. 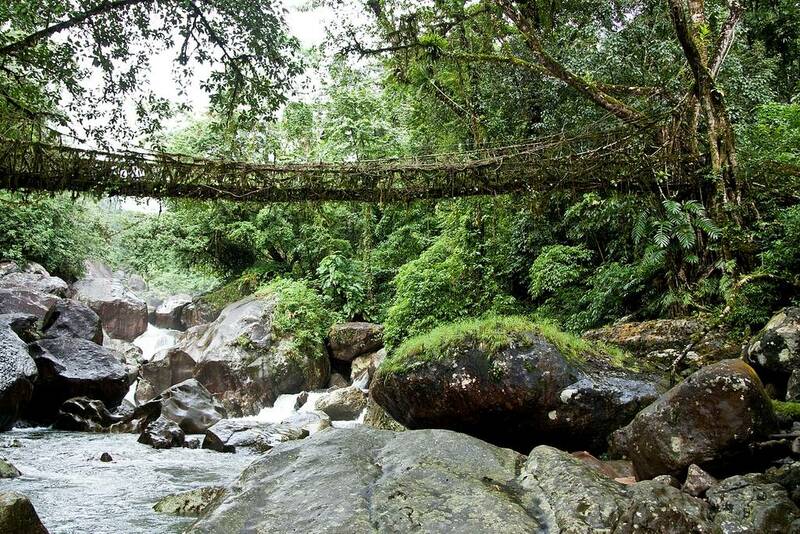 Meghalaya in the north east of the country is home to mountainous subtropical forests. 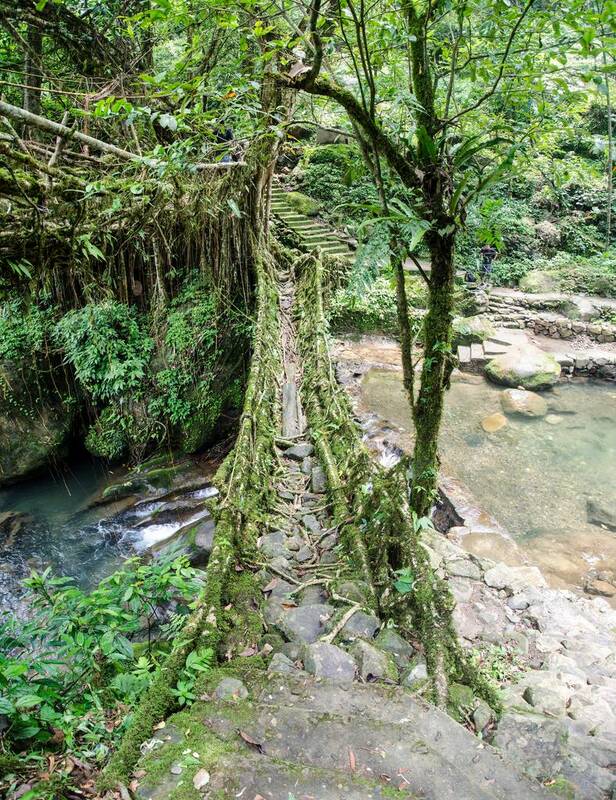 In order to get around, local people have come up with an ingenious form of natural engineering – the living root bridge. It always seems to rain here – the rivers are often very dangerous to ford. 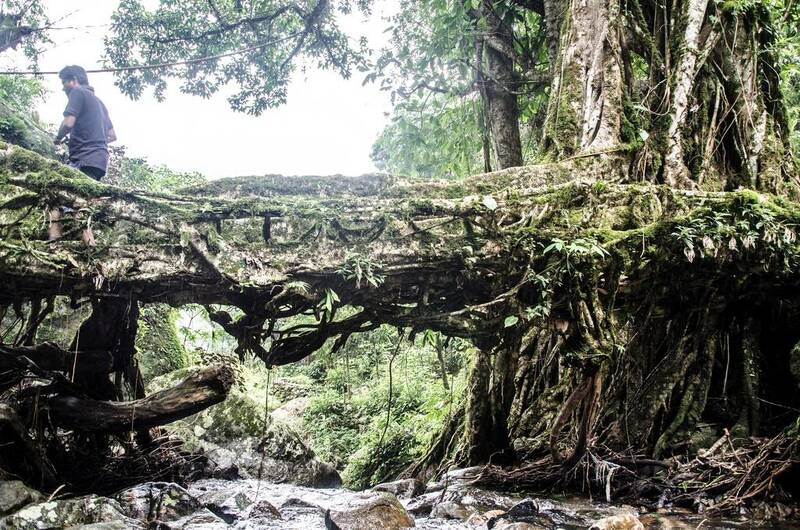 This is one of the wettest places on the planet. 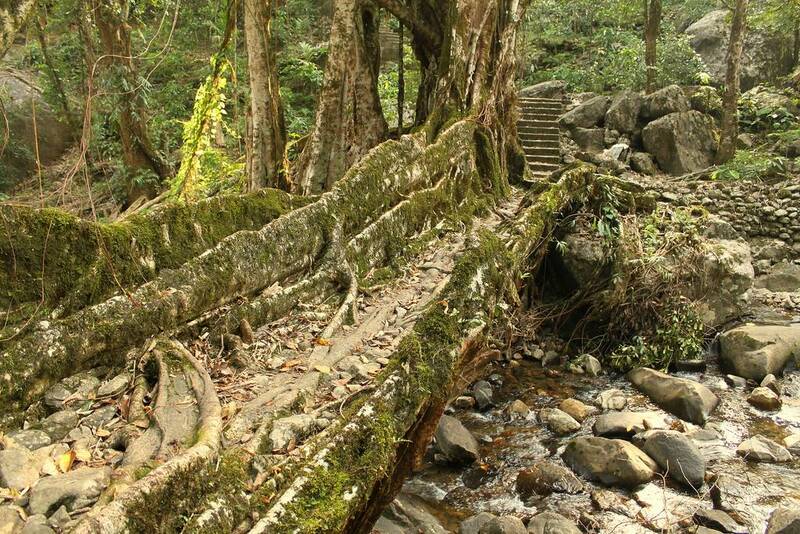 The steady precipitation combined with the rugged terrain, steep hillsides and thick foliage of the forests would make many parts of the Meghalayan jungles unreachable. Yet the inventive and resourceful people who live here have found a way – but they had to be very patient, at least to begin with. 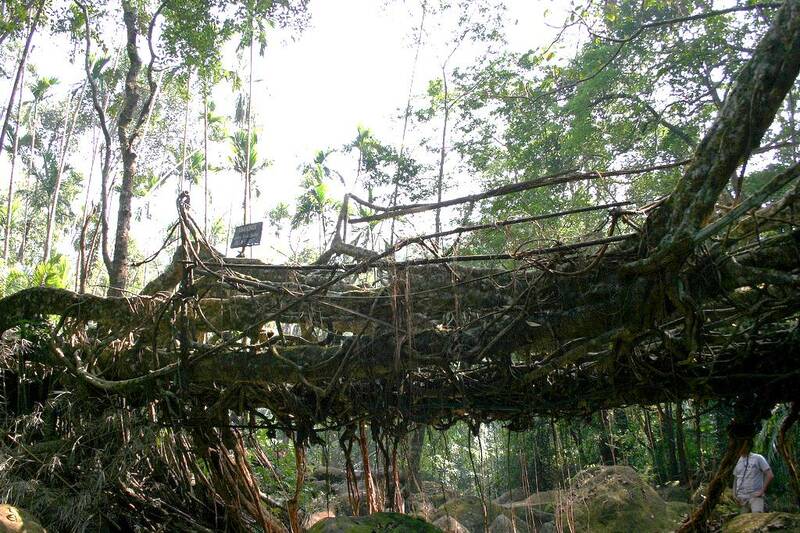 Bridges were needed – that much was obvious. 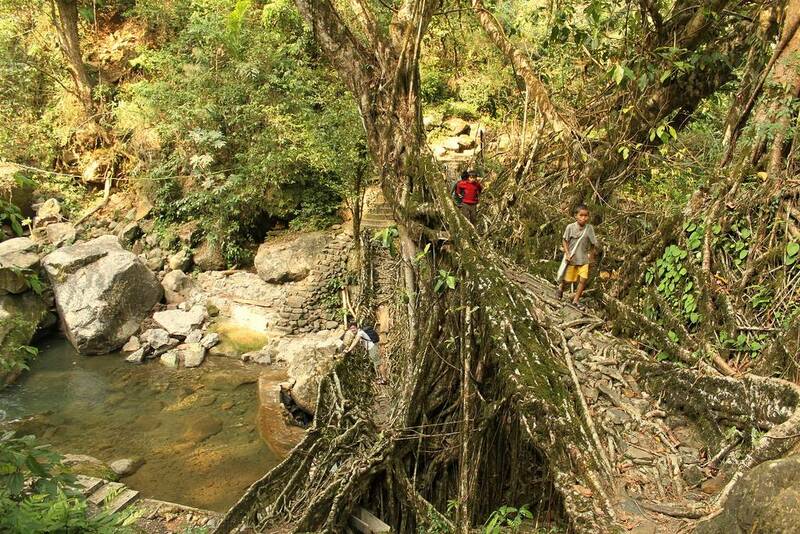 Yet without the large tools needed to hew down trees large enough to do the job the War Khasi people were stuck. Yet one of their number had noticed the way that the trees in the area grew. 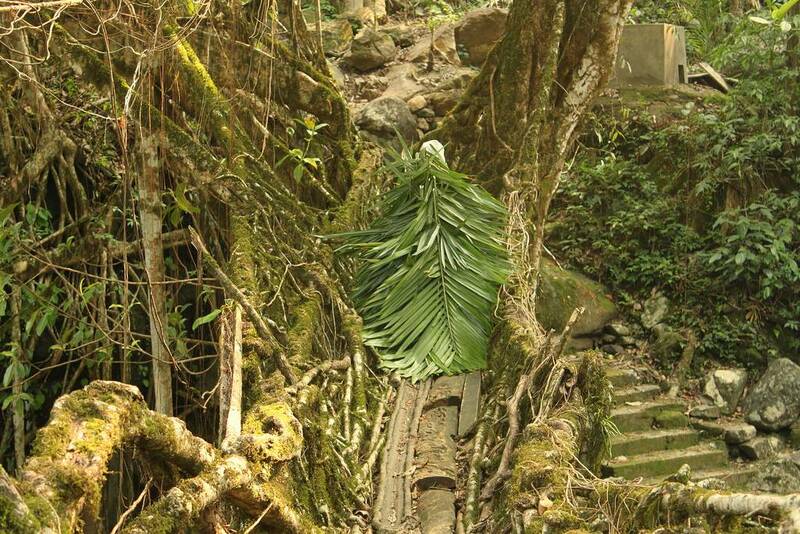 Growing on boulders on almost sheer cliff faces or alongside the fast flowing rivers, the trees would take root. Once secure in their primary locale they would extend roots down to the water. These roots were at first short and flexible yet over many years they would become immensely thick and strong. 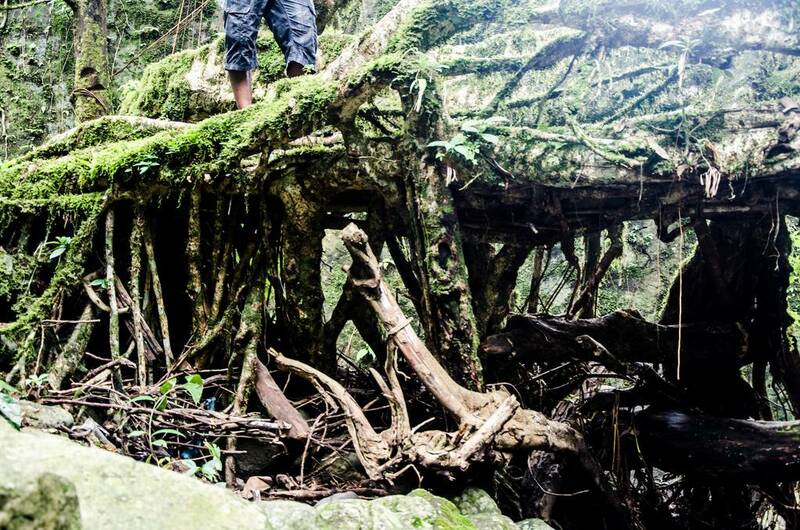 The answer lay in manipulating these roots to the advantage of the people. 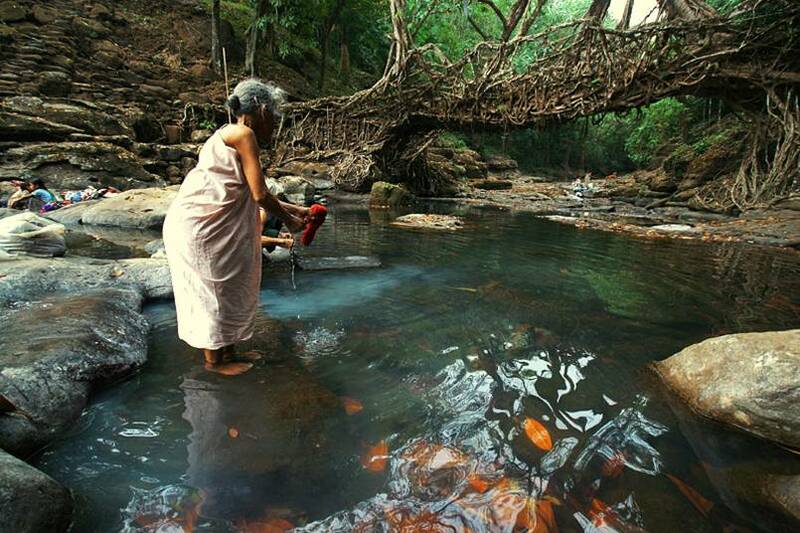 Over many years the people gradually trained the roots to grow across the gap until they took root on the other side (or indeed met in the middle with roots from the opposite riverbank). 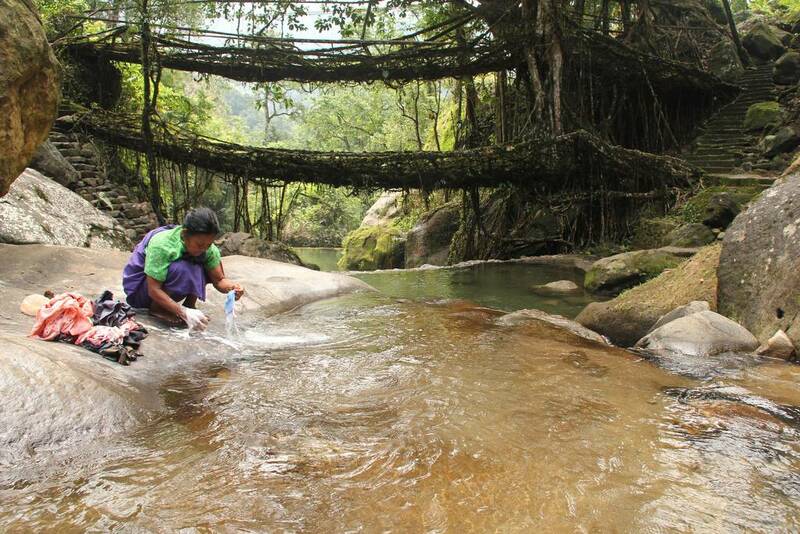 Over time the War Khasi people became incredibly efficient at this feat of natural engineering – some of the bridges have a span of over thirty meters. What is more, with careful maintenance they are both self-reinforcing and self-renovating. 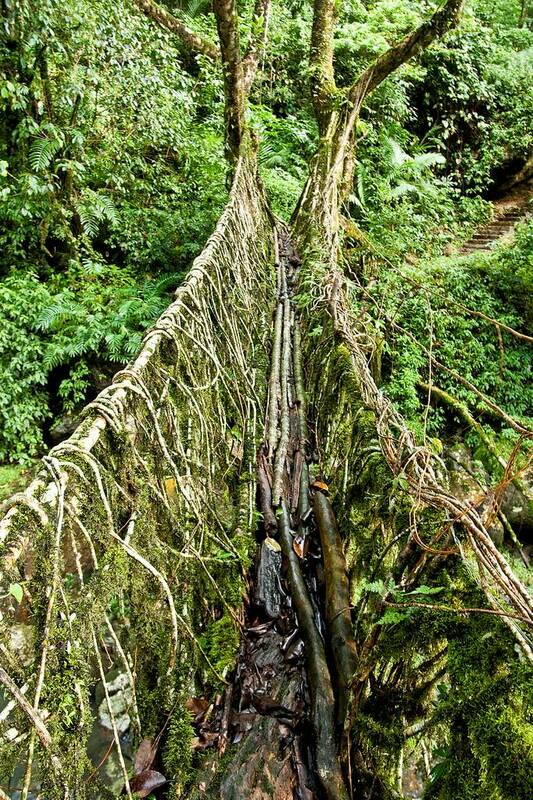 A number of the bridges are thought to be over five hundred years old. Where once almost impassable rivers and steep hills blocked their way, the people were now able to spread. They have two related trees to thank which both exhibit the same root behavior. The first is the Indian Banyan Ficus benghalensis and the second is the Rubber Tree, Ficus elastica. 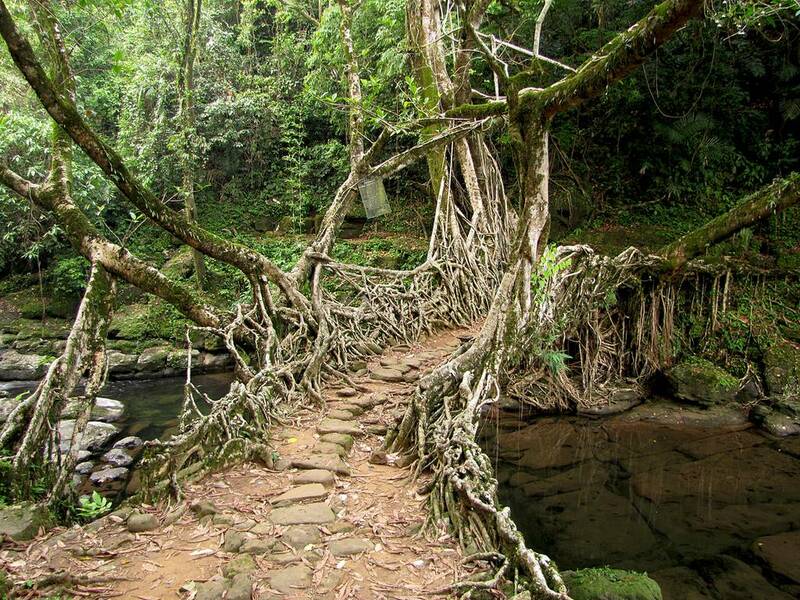 Yet how on earth do you make a root grow in the direction in which you want? This is thanks to another plant, the betel nut. The Khasis take a trunk from this large shrub and slice it, hollowing out the middle. This creates a guidance system for the roots. 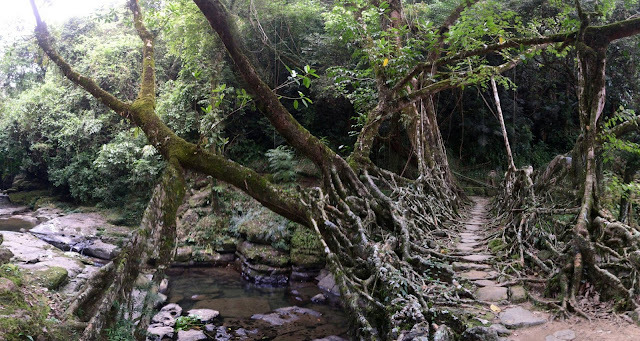 Once the roots reach the end of one of these guides, another is affixed to the end – and so on until the bridge is complete. They are plentifully watered by the rain and once they reach the other side of the river they take root there. 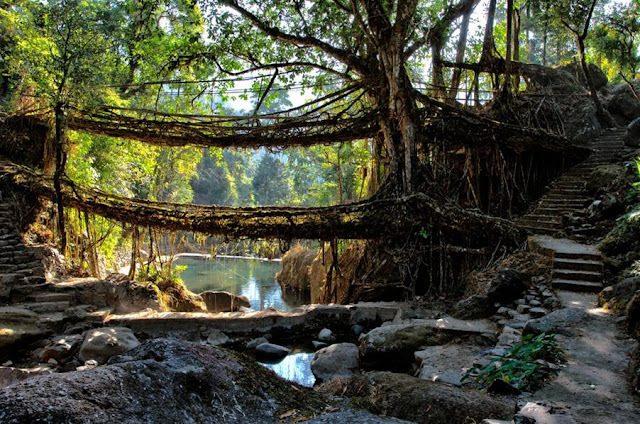 Yet all of this takes time – often up to twenty years to cross the river and then more for the roots to grow and become sufficiently strong to walk upon. 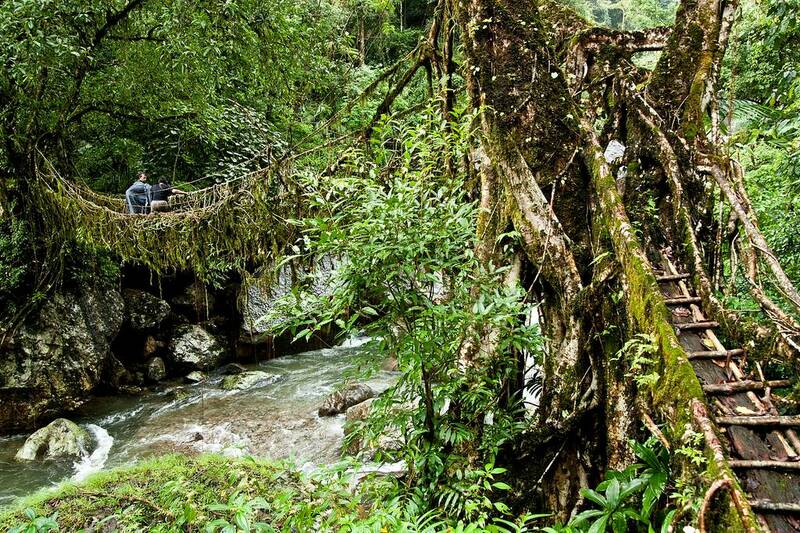 And strong they are – these bridges can hold dozens of people at a time. We often talk about the future, of inter-generational spaceships making it to solar systems many light years away from Earth. 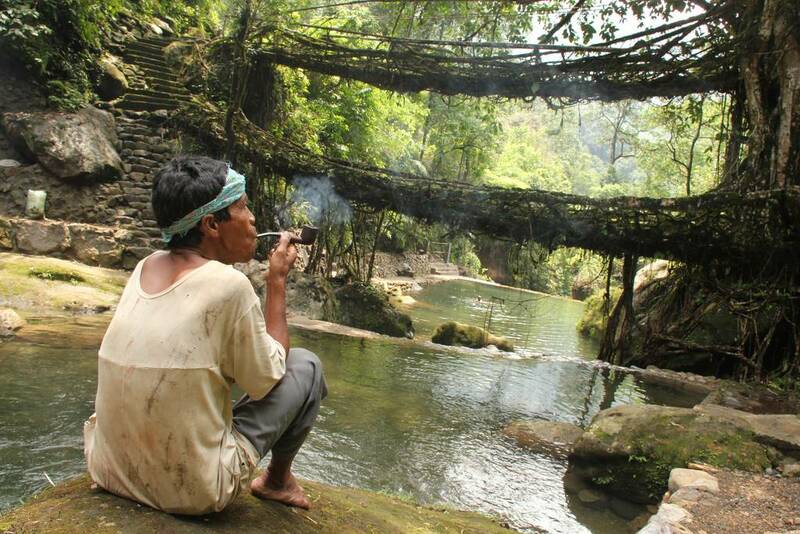 Perhaps in their own way the War Khasi people have shown that this sort of patience and perseverance is possible.